It appears that we're fast becoming the Internet's premier destination for wine aerator video reviews. Overall, I'd rate this product highly and consider it a fine addition to the increasingly crowded single-serving wine aeration market segment. I'd like to thank Will Priest for his time and enthusiasm for my questions while testing the Respirer. I hope to have an interview with Will coming up in a few weeks. I'd also like to thank all of my readers over the past year as we've gotten this site off the ground. I have been truly humbled by the response and I appreciate all the visitors, the comments, the lurkers, and especially those who have purchased products through the links that appear from time to time on this site. It has been awesome getting to know fellow wine lovers better, as well as making connections with those in the wine trade. Working on content for this site has given me reason to go even deeper into this wine hobby that I'm so obviously fascinated by. I'm looking forward to even bigger and better things in 2009! Update (1/22/2009): Click here to read an interview with Will Priest -and- an exclusive coupon code for free shipping on a Respirer through February 14th, 2009. Question of the Day: What do you think of the Respirer? Any quesitons you'd like to ask its inventor? This is Part 2 of a 3 part interview series with Paul Clary. Part 1 can be found here. Part 3 can be found here. Q: Would you consider yourself more of a grower or a winemaker? Which is harder? Paul Clary: I'm a winemaker from root to glass. The hardest part about it is staying up for sleepless nights waiting for the frosts. 2008 was an unrelenting spring, as far as frosts go. 25+ frost events, where our previous "worst year" was 5 events. Q: Same questions as with grape growing- can you give some specific examples of things you can do (or not do) in the process of making wine that can really make a difference in the quality of the wine produced? Paul: A routine late-fermentation addition of yeast nutrient can head off sulfide issues... On the "not-to-do" side, I'd say: Resist the temptation to tinker with the wine for off-flavors during barrel aging. The wine is Alive, and usually those off-flavors will resolve by themselves. Q: Your 2004 Clary Ranch Grower's Reserve Pinot Noir seemed a little "bigger" than the 2006. Do you agree? Don't get me wrong the 2006 was awesome too- in fact it may have been more elegant. But at any rate- if you agree- was that a function of the grape growing season or something you did differently in the winemaking process? Paul: Yes, the 2004 is a bigger wine, a stand-alone cocktail. The lighter 2006 goes better with a wide variety of foods. 2004's Pinot was made entirely of grapes from Block 4 - the clone is Pommard 4. 2006's Pinot contains mostly clone 4, but also has significant Dijon 113 from blocks 2 & 3, and 667 from block 6. That said, year to year the weather brings what it will, and it is reflected in the resultant wine. 2006 was a lighter year. Q: I always get "tobacco/cigar box" aromas on your Pinot. Do you get that too? If so, where do you think that's coming from? Paul: That comes from soaking my old cigars in the wine - just kidding! It's the grape and its environment. Any flavors are coming from the interaction between the grape, the yeast and the barrel. We use 40-50% new french oak, Medium plus toast. Q: Are you considering making other varietals in the future? Or is Pinot and Syrah your passion? Paul: For now, I'll stick with Pinot and Syrah, though I'd love to do a Riesling or Gewurz someday. If you'd like to purchase Clary Ranch wines, we've put together a *special* offer for Wellesley Wine Press readers. Clary Ranch has agreed to extend their Holiday Gift Pak offer through January 15th, 2009 for all orders mentioning "The Wellesley Wine Press". When placing your order over the phone or in the comments section of your order, just mention this web site and you'll receive FREE SHIPPING plus great pricing on 2 bottles of Clary Ranch wines. Click here to visit the Clary Ranch Web Site. Click here to Order Clary Ranch wines and take advantage of this special offer. If you have any comments or questions for Paul, please leave them below and I'll be sure to pass them along. I'd like to thank Paul for the time he took answering my questions for this interview so honestly and enthusiastically, and especially for the special offer he's extended to my readers. Q: What did you do for a living before getting into wine, and how did you learn to grow grapes and make wine? Paul Clary: Before planting the vineyards, I was a carpenter. I grew up helping out at my grandparents' walnut orchard in the foothills of the Sierras. Learned to drive a tractor at age 12. Set fenceposts, trapped gophers, watered seedlings, harvested and processed walnuts. So my agricultural education started from my earliest days. I studied Biological Sciences at UC Davis, getting my Bachelors degree in 1982. 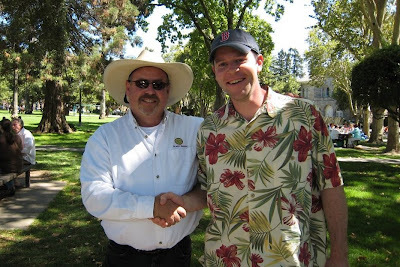 In 1998, when I purchased the ranch, I studied viticulture with Richard Thomas at Santa Rosa Junior College. I completed planting 15 acres of Pinot Noir and Syrah in 2000. In 2001, faced with the task of luring buyers for these unproven grapes, I studied winemaking with Ernie Farinias, the cellarmaster at UCD. Later, with the help of fellow UCD Alum, Richard Delmonico, I produced the first wines from Clary Ranch. These wines were used to "demo" the vineyard for grape buyers. I continued to make wine in subsequent years, culminating in the jump to commercial production in 2004. Q: As we were walking through the vineyard when I visited Clary Ranch, I think I noticed for the first time how much care is put into growing grapes for making wine. But at the same time, in some ways, growing grapes is a very fundamental "farming" operation. Can you give some simple examples of things a grower can do (or not do) that truly makes a difference in the quality of the wine that comes from the grapes? Paul: Growing grapes is farming. Having a worker make 1 pass through the vineyard costs $X. Whatever he does has to be worth more than $X. Wine grapes have a high enough value, when grown properly, to justify the level of care that you see. Keep in mind that whatever you do, you've got tens of thousands of whatever to do. A simple example of things we do for quality's sake would be pulling the leaves that give morning shade to the grape cluster. We leave the afternoon shade leaves, protecting the clusters from sunburn. The additional morning light results in better color and richer flavors. Q: How much do you think consumers should pay attention to appellation when making wine selections? I mean, do you think it's smart to pay a premium for Napa Cab over Sonoma? Is locale more important than winemaking -or- is winemaking more important than locale? Paul: Appellation matters. Farming matters. The right grape, grown properly in the right spot is what matters most. Q: A lot of wine people will say that the Willamette Valley makes the best Pinot Noir is the US. I think both regions produce excellent Pinot. How do wines made from grapes grown in the Sonoma Coast differ in general from Oregon Pinots? Paul: I need to drink far more Oregon Pinot to begin to have anything intelligent to contribute on this. Q: I've heard that the movie "Sideways" has really increased the popularity of Pinot Noir. Did you have your Pinot planted prior to the movie coming out? 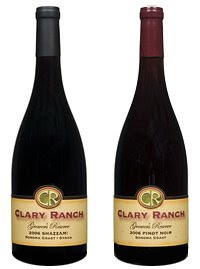 Either way, is Clary Ranch ideally suited to Pinot and Syrah? Or could it support other varietals? Paul: Sideways came out several years after we planted. I was certainly glad to see the bump that it gave to the market. While both Pinot Noir and Syrah do very well here, I'd guess that Riesling and Gewurztraminer, among others, would do equally well. Unfortunately, the farming economics of White Wine aren't as advantageous as those of Red Wine. "the aroma of a corked wine as being musty or moldy, like wet newspaper or cardboard, a wet dog or a damp, moldy basement. In other words, it smells like musty mold"
I personally think another comparison worth making is that corked wine smells like the rind of Brie cheese. Wine should *not* smell like this! Wine should smell delcious and fruity- not austere and moldy like a nasty cellar. Nobody wants to be that shmuck of a customer who "poo poos" a wine and returns it demanding another bottle, so we say nothing and drink a wine we don't care for. Recently, we did our grocery shopping at the Whole Foods Market in nearby Wayland, MA. The Wine Buyer there, Wayne Dills, is a great guy. In the few times I've been there I've seen that he won't let a shopper pass through his wine section without at least saying hello or asking if he can help. We started chatting last time I was in there, and he recommended a couple of inexpensive bottles. I brought them home and immediately opened one of them up. Deanna wasn't impressed- she thought it was "funky". I of course wanted to plow through and enjoy it but after a couple of sips I agreed with her. It just wasnt right. It smelled like moldy cheese. It didn't smell good at all. The next day I brought it back, but I didn't just want a refund- I wanted Wayne to assess the wine and let me know whether he thought it was corked. One whiff and he agree- it was indeed corked. I found what happened next really interesting. While Wayne was smelling and tasting the wine a woman who was shopping in the area asked if we were doing a wine tasting. Wayne explained that "no, we were just smelling what corked wine smells like- wanna smell it"? She gave it a whiff and said that she smells wine like that all the time and didn't know that's what corked wine smells like. And then another guy came by and was also intrigued. It was really educational- how would we know what corked wine smells like other than an occasion like this? I explained to Wayne that I'm sometimes bashful about returning wines I suspect are corked because I don't want to be "that guy". He replied that he was *glad* I brought the wine back because retailers can easily exchange corked wines for new bottles from the distributor -and- he'd much rather have me bring back a wine that I suspected of being corked rather than quietly think that his recommendation was a poor one. This is why you should always return corked wine. I'd never thought of it from that angle! Return the bottle as close to full as possible. If you've poured multiple glasses, pour them back into the bottle with a funnel. You don't want to look like you guzzled half the bottle and then want a refund. Buy locally from trusted local wine stores to enable easy returns. Establishing relationships with trusted local wine stores can benefit you on a number of levels. Ask the most knowledgable employee in the store for their opinion of the wine. That way you won't come off looking like a wine snob- you're honestly asking their opinion for your educational purposes. If the store doesn't care to assess whether the wine is corked or not and refuses to give you a refund it is definitely time to look for a new wine store. I've read some estimates that as much as 10% of wines are corked so you can't afford to be losing 10% of your wine spend on bad bottles. Question of the Day: Have you had the courage to return a corked bottle of wine to a store? At a restaurant? This might be the biggest discount I've heard of from Wine Enthusiast and could be quite a savings if applied to a big ticket item like a EuroCave Wine Cellar. The usual exclusions apply (can't be combined with other offers, can't be used on certain brands, etc). I don't see EuroCave, Vinturi, or Riedel excluded, so some of the more popular products seem to qualify. Unfortunately, I don't think you can combine this 25% off offer with their free shipping offers, and shipping can be quite expensive through Wine Enthusiast. Like $9.99 for a $39.99 Vinturi wine aerator which would make Amazon.com's shipping-included price better than Wine Enthusiast's, so be sure to shop around. The good folks at Clary Ranch have a deal that's ending tomorrow (December 17th, 2008) that is pretty darn good. A 2006 Syrah Sonoma Coast Grower's Reserve "Shazzam!" Regular price for these two wines would be $39.50 + $28.00 + ~$15 for shipping (my estimate)= $82.50. With their Holiday Gift Pak offer the total is $55.00 shipping included. This is a savings of 33%. Click here to visit ClaryRanch.com's online store and consider this offer. Read more about my take on Clary Ranch wines here. I'll be following up in the coming weeks with an interview with Paul about his awesome wines. A year ago at the Hingham Wine Merchant's annual holiday show, I wanted to round off a case of wines I was buying so I threw in a couple of bottles of 2004 Artesa Cabernet Sauvignon Napa/Sonoma. I thought the wine was decent, though it's hard to tell at a wine tasting where dozens of wine are sampled. Shortly thereafter, I brought a bottle to a neighborhood holiday party. The wine was a *stinker* at the party. Not only was it uninspired aromatically, but it had an excessive amount of sediment. Nearly every glass poured from the bottle was cluttered up with significant chunks of debris which made it hard to enjoy the wine at all. So each time I looked through my wine refrigerator looking to select a bottle for the evening for the past year I'd see the Artesa; and I'd pass. At a retail price in the mid-$20s, it was too expensive to drink on a weeknight, and not nice enough to save for a special occasion. So last week, I decided to crack open the 2nd bottle. Much to my surprise, the 2nd bottle was *fantastic*. I was stunned! It was quite possibly the most near-perfect wine I've had in months. I gave it 92 points (see my Corkd review here) but I could have easily gone higher. It smelled of deep dark fruit and smoke: Good smoke- like the smell of the Capital Grille on Newbury Street in Boston. It was dense, fruity and savory on the palate. It wasn't too over the top either- it showed some restraint and finesse. It was an amazing California Cabernet. A case of bottle variation? It's quite possible. Like I said the first bottle threw sediment and the second had none at all. I don't think it's possible for sediment to dissipate over time, so it would seem that the two bottles were quite different. A case of settings my expectations low and being pleasantly surprised? That's possible too. I'm frequently disappointed by wines that are overly hyped or expensive- perhaps this is a similar effect in the opposite direction? Perhaps I was so sure this wine would be a stinker that I was amazed that it was even mediocre and consequently was blown away. A case of a wine improving over time and catching it at a better time? This is the most interesting possible angle, and one that I hope is the case. I'm skeptical though- could the wine possibly evolve this much in just a year? I dunno. I've heard people in the wine trade say "I tasted this wine last year and I was like 'meh' and this year I'm like 'woah'!" If I had to guess, I would say it was a combination of bottle variation and catching the wine at just the right time. This experience makes me think that it might be worth trying to wait until California Cabs are 4-5 years old as a rule (rather than the 3 years at which they're typically released). Speaking of which, it's worth mentioning the web site Cellar Tracker which, among other things, is a repository of user-submitted ratings for tons of wines tasted over time to give people a feel for when specific wines are at their prime. If you're interested in trying this wine, the good folks at The Wine House in Holliston, MA have a couple of cases still available as of this writing. Give them a call if you're in the area, or seek this one out somewhere near you and let me know what you think. Question of the Day: Have you ever had a wine "turnaround" on you like this? Either over time or one that similarly surprised you in a good way? Update (1/16/2009): I also did this through US Airways. What a deal: $25 + 1,000 Delta SkyMiles for a 1-year subscription (print and online) to Wine Specatator. Enjoy! Simple and effective- works really well. My sister Kristy bought this for me for Christmas a few years ago and I still use it all the time. I love this corkscrew. It's amazing how confusing and ineffective expensive corkscrews can be. Skip all of the fancy winged, electronic, hydraulic nonsense. Get this one and open wine like the pros. Also opens beer bottles and has a foil cutter (though the Screwpull Foil Cutter is much more effective). Also available at Crate & Barrel. As reviewed here and crowned winner of our head-to-head aerator blind tasting here. See also an interview with Andrew Lazorchak from Soirée here. Great guy, great product: Great gift. Buy direct from Soirée here. As reviewed here. See also an interview with Vinturi inventor Rio Sabadicci here. This aerator is one of the most popular wine accessories on Amazon.com and gets great reviews. I think both the Soirée and the Vinturi are great products any wine lover would like to receive as a gift. Do a little research. Print out Wine Spectator's list of their Top 100 Wines of 2008 and take it to a nearby wine shop. They'll be happy to help you find a nice bottle from the list, and the person receiving the gift will appreciate that you took a little time to delve into their world to research wine. Try to pick a bottle that has a special meaning in some way. For example, "Remember that time we went to California? This wine reminded me of that trip." Or, "This bottle is Italian- I thought it would be nice to enjoy together on pizza night." Or, "This bottle is French- If we can't go to Paris this year maybe we can drink this until we think we're there." Labels matter. Unlike when doing a blind tasting where only the juice matters, when buying a gift the whole package matters. Buy a wine with an attractive label from a good producer. Also, more expensive wines tend to come in heavy bottles, so all else equal go for the heavier bottle. If Cakebread isn't available in your area (it's tough to find on the East Coast) Caymus is another nice one. Over the past 10 years, Caymus has been (arguably) the most consistent producer of quality Napa Cab. The product links above are connected to my Amazon Associates account. If you found this list helpful and would like to buy one of the products listed from Amazon, feel free to use them. If not, no worries. Question of the Day: Do you remember receiving a wine gift you really liked? If so, what was it? Subscribers of the Boston Globe are eligible for $20 off a Sunday admission to the 18th Annual Boston Wine Expo. The Expo is January 23th-25th, 2009 at the Seaport World Trade Center. We went last year- you can read my review here. In short, the event is a bit of a "mosh pit meets wine tasting" experience. I enjoyed myself for sure, but I wish it weren't so crowded and competitive. Visit http://bgextras.com and log in with your Boston Globe subscriber username and password to get the $20 off the regular Sunday price of $75 (bringing the price down to $55). The link is also valid for $20 off a Two-Day Admission. Question of the Day: Are you going to the Boston Wine Expo? "Don't miss out on our Weekend Twitter Offer: 20% Off At Wine Enthusiast until Monday. Use code SHOP20 http://bit.ly/11r0q"
What is Twitter? Read more about my take on Twitter here. In my opinion, Twitter is the real deal. You can follow me on Twitter here. UPDATE: This deal has ended, but through December 24th you can get 25% off at Wine Enthusiast using the information in this blog entry. Question of the Day: What do you think of the Wine Enthusiast product catalog? What do you think of Twitter? I drove by Post Road Liquors in Wayland, MA this morning (on the way to Finagle a Bagel with the boys- they love the "Bagel Buzzsaw".) The wine of the month is RED: All red wines are 20% off if you buy 6 or more. That's a broad category- it should be easy to build a 6-pack. This sale holds at all three of their locations. More info about locations can be found on their website which also mentions a "Gala Wine Sale" December 5th and 6th. I'm not sure what that means, but if I get a chance today I'd like to stop in and check it out. Update: I made it to the Wine Gala- sort of. It was a wine tasting where the entire store was 20% off if you bought 6 bottles or more. I missed the wine tasting but since all red wines are on sale the rest of the month it doesn't feel like much of a loss. It would've been nice if their web site described the details of the Wine Gala with more clarity. Further reading: You might be interested in this more recent tasting at the Post Road group scheduled for February 28th, 2009. Update (November 17th, 2009): This wine was named Wine Spectator's Wine of The Year, so expect demand to spike on this wine as a result. I haven't seen it available at retailers in some time. It was hard to come by ever since it was rated 95 points and cost only $27. I'd love it if you subscribed to the site via E-mail to hear about great wines like this before they sell out. "Ripe in flavor, with a vivid array of black currant, blackberry, violet, black tea and black pepper aromas and flavors that zoom through to a long, expressive finish. Shows subtlety in the layers of complex flavor against a refined structure. Tannins are present but nicely contained." At a release price of $27, and discounts likely available given the production level of 6,000 cases, expect to see this one available at Costco or perhaps Trader Joe's (I swear I've seen it there in the past) for somewhere around $20. 95 points for $20 sets off alarms here at the Wellesley Wine Press, so I'm looking very forward to getting my hands on some of this. I should mention that one of the wines that made me really start paying attention to Spectator ratings was also from Columbia Crest and also rated by Harvey Steiman: The 2003 Columbia Crest Grand Estates Merlot. It was the first wine I tasted and said "Hey, maybe these guys at Wine Spectator know what they're talking about!" I gave that wine 92 points in my Corkd review and I've got just a couple of bottles left from the case I purchased. I'll be sorry to see the last of that go, but since each point north of 90 is exponentially more difficult to attain, I've got really high hopes for this 2005 Reserve Cab. If you like this quality-price ratio, you might also be interested in this 96-point $29 Sauvignon Blanc. Do you like hearing about wines of extraordinary value like this one? If so, consider subscribing to The Wellesley Wine Press via E-mail or in a feed reader. We talk about wines like this year 'round giving you a chance to buy them before they sell out. Question of the Day: Have you seen this wine in store yet? If so, share the wealth and let us know where! I'd love to see the same kind of listing we came up with for the 2006 Villa Pillo Toscana Borgoforte. Not to be outdone by Wine Spectator Magazine (who released their Top 100 list a few weeks ago), Wine Enthusiast Magazine released their Top 100 list today. Click here to have a look. I picked up a bottle of the 2007 vintage of this same wine at the Hingham Wine Merchant's Holiday Show. I liked it very much at the tasting -and- when I spent some quality time with it the other night. I gave it 90 points in this Corkd review. I'll definitely keep an eye out for more from this producer- especially their Pinot Noir if I see it. I totally agreed with Wine Enthusiast and Boston wine blogger Ken's Wine Guide on this one. This is a phenomenal Chardonnay- I crowned it my favorite white wine of the summer in my very first blog post here on the Wellesley Wine Press. I really wanted to love this wine, but I just didn't. That said, it was a good effort and one of the few wines I've tried that I could easily see getting better with age. It was just a little wild at this stage. Boudreaux Cellars was prominently featured in Gary Vaynerchuk's first book: 101 Wines . I'm looking forward to trying their Cab, but I'll let it rest a few years. It's interesting for me to look through other wine magazines after being such a Wine Spectator "homer". For me, Spectator is the Beckett Baseball Card Monthly/Car Audio Magazine/Martha Stewart Living of the wine world. If you read any one source for too long without looking at other ratings it's easy to begin to think that a certain wine *is* 90 points. Wines aren't ratings- they've each got their own characteristics and we've each got our own preferences. That said, I do have my mind calibrated to Wine Spectator's rating scale. As I've said before: "In Laube We Trust." Even though Spectator, Wine Enthusiast and the Wine Advocate all rate on the same 100-point scale there does seem to be differing levels of discretion from each publication in terms of how scarce a 90 or 95 point rating is. I *think* Spectator is the "stingiest" of the 3, but I don't have data to back that up at this point. It's just a hunch. "Wines are always tasted blind, in flights organized by varietal, appellation or region. Bottles are bagged and coded. Each tasting begins with a wine previously rated, which is tasted non-blind as a reference point. Other already-rated wines are inserted into the blind tasting to ensure consistency." "Tastings are conducted individually or in a group setting and performed blind or in accordance with accepted industry practices." It's this last part that concerns me about Wine Enthusiast. Saying that wines are tasted blind or not technically leaves the door open for 100% of the wines being tasted non-blind! It's like when a store has a sign in the window saying "Up to 60% Off! ": Technically there could be *nothing* on sale in the store at all. Maybe I'm believing in Santa Claus to think that Spectator does all of its tasting blind. If they do taste 100% blind I'm extremely impressed with either Spectator's tasting consistency -or- Caymus (for example) for producing so consistently. 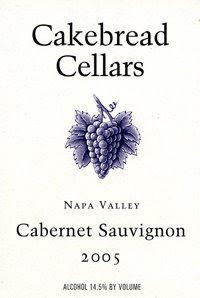 Caymus Cab has scored between 91 and 93 every year for the past 10. That's amazing to me. Question of the Day: What is your most trusted source of wine reviews? Why?